In 2015, in spite of widespread public opposition, California became the first state in the U.S. to remove a philosophical and religious exemption for childhood vaccines as a requirement for school attendance. 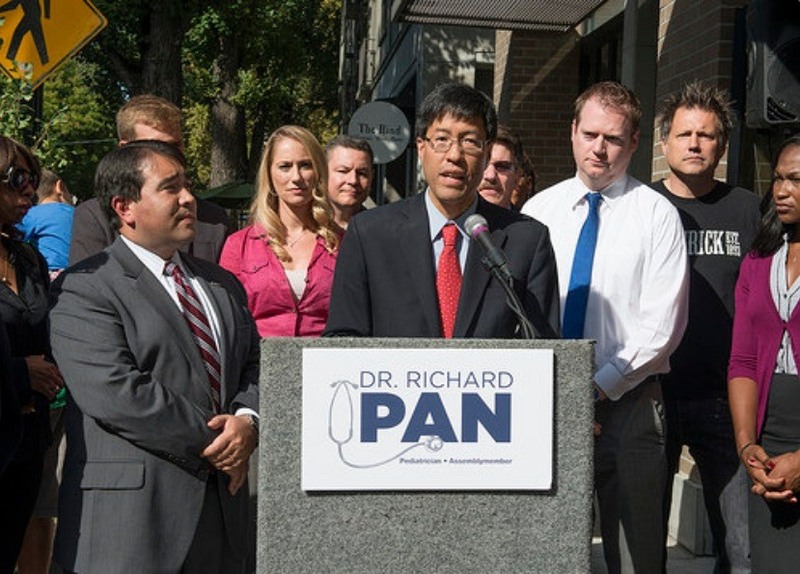 The bill was authored by Dr. Richard Pan, with strong ties to the pharmaceutical industry. California is now one of only 3 states in the U.S. to not allow parents the choice to opt out of vaccines for their children (Mississippi and West Virginia are the other two, and apparently never had parent exemptions.) The only way to get a vaccine exemption in these three states today is to have a doctor write a vaccine exemption based on medical reasons. However, Dr. Richard Pan is not satisfied with just removing parental choice in matters of childhood vaccines. In public comments and in a commentary published in the Journal Pediatrics, Pan has made it clear that he wants to try to reduce or eliminate altogether the choice of family doctors in writing vaccine medical exemptions as well. The California Medical Board is currently being sued for intimidating doctors who write vaccine medical exemptions. Dr. Pan will single handedly be responsible for one of the largest migrations OUT of California in decades. The vaccine con is on and people are aware of it. The sheep will remain and they and their kids will eventually be killed off from the poisons they will voluntarily allow BigPharma to inject into them, that is their choice. The smart ones will flee to other areas where they are allowed CHOICE based on their own research and what they have had happen to them in the past. Pan will have his day as a paid Pharma shill but it will end in disaster all the way around. Richard Pan is an insufferable pharma whore who has overstepped his bounds in the personal life of every parent in California. Not only that, he has proven that he is not a friend to those he represents and is an enemy of every family in this state. Go deep into pious solutions, because R Pan has proven himself impious and demoniac. There are 2 kinds of persons in the material world, so association with a Godly person is for a pious soul. Just decide and discriminate between who knows about God and who does not know about God. Read chapter 6, if you can't read the whole book. Pan is Big Pharma pig. He owns stock in vaccines and manufacturers so of course he wants every child vaccinated. The more they inject, the more he gets paid. He could care less about any child that damaged or killed by his greed. And I guarantee you nobody in his family is vaccinated. Another Bill Gates of sorts. I wish morally corrupt jackoffs like Pan would be forced to take every damn injection themselves. I definitely agree with the last two comments however, to get this Pan-Nazi out we need something with teeth. Forced medical procedures are against the Geneva Convention. I believe forced vaccinations would fall under that. Dr. Pan is a big-pharma whore. He is more concerned with the money he gets than the dangers some vaccines pose. Shame on Dr. Pan...he should lose his medical license.